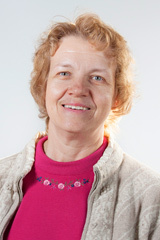 Gwen is employed as a full-time faculty member for Columbia Gorge Community Colleges's Nursing Program. She graduated from University of Portland with a Bachelor's of Science in Nursing and completed over six years of active duty and ten years of Reserve duty in the Army Nurse Corps. She has maintained certification in perioperative nursing through the Association of peri-Operative Registered Nurses (AORN) for 16 years. Experiences include Head Nurse of Cario-Thoracic Service at Madigan Army Medical Center, ENT Head Nurse while stationed at Yongsan Community Army Hospital, Seoul, Korea and Neuro Service Head Nurse at Dwight David Eisenhower Army Medical Center, Ft. Gordon, GA. Gwen was employed at Mid-Columbia Medical Center (MCMC) for 19 years prior to coming to CGCC. Her experiences at MCMC included perioperative, acute care and endoscopy nurse, as well as four years as the hospital nursing education coordinator.